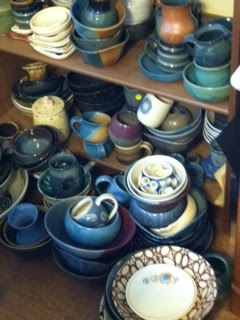 Shelf Life – Pottery, paintings, photography, and more! I have often found that when my outer spaces are organized my inner spaces tend to be more organized as well. 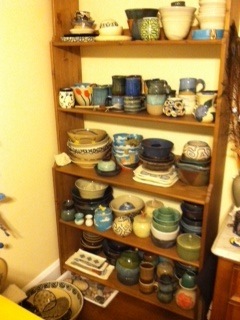 Today, I turn my attention to the tall bookshelf that holds all my pottery. The contents of this shelf are beyond capacity and the pieces spill out across the floor. There is no organization here! As I move toward opening a shop on Etsy, I know that the life of this shelf needs to become a bit more ordered. Feels better already–outside and in!